Records in a Journal: A puff to the good old days! A puff to the good old days! A Puff to the good old days – well, thinking of a name for this post was tough, adjectives to choose from were many! Finally, decided on this one because of the faces I remember from the ride – There was this old gentleman for example, bespectacled and pale; he sat looking wistful, but with a slight hint of a smile on his face. Never once did I see him move during the entire length of the ride; he was admiring the landscape but it was something more than that – Yearning? Nostalgia? I know not. What I did realize was, some events by sheer dint of circumstances bring back good times…this ride certainly did! The ride is organized by the by the GES on the first Sunday of every month from Korntal till Weissach in the Stuttgart region. Thanks to the efforts of the society, tourists and natives alike get to experience a rich flavour from the past. We boarded the first service of the day at 9.05 AM from Korntal. A schedule of all the services with the travel fare is available here. The stretch spanning 25 kms takes 1 hour by the train. 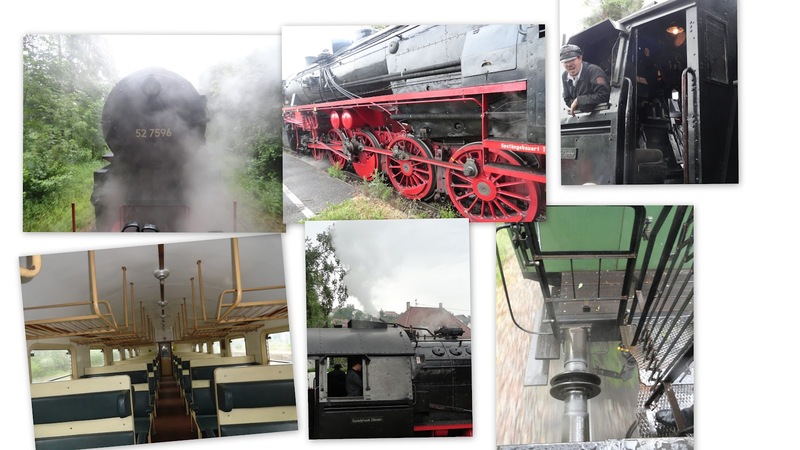 The chugging of the engine was a black and white melody, the whistles and the steam it breathed out while evoking many a movie scene also had a soothing effect. Perhaps, it made us all long for a world where things moved slowly and surely, nerves were less frayed, people were more content with whatever little they had and grittiness of character was given its due. There were scores of kids with their grandfathers and grandmothers. The way two generations -which seem to have little in common at first sight – connected made for quite a sight! It was drizzling all through the brief journey till Weissach adding to the beauty of the landscape. People leaned on the rails between carriages clicking pictures, smoking or cuddling their children. One hour went by in a jiffy and we were in Weissach. It took nearly 40 minutes before we were all set for the return journey. We had a peep into the engine and people from this charming town gathered around the train to click more pictures. On the way back, the carriages were more silent. Perhaps, nobody wants good things to come to an end! Rain drops on a summer morning...!